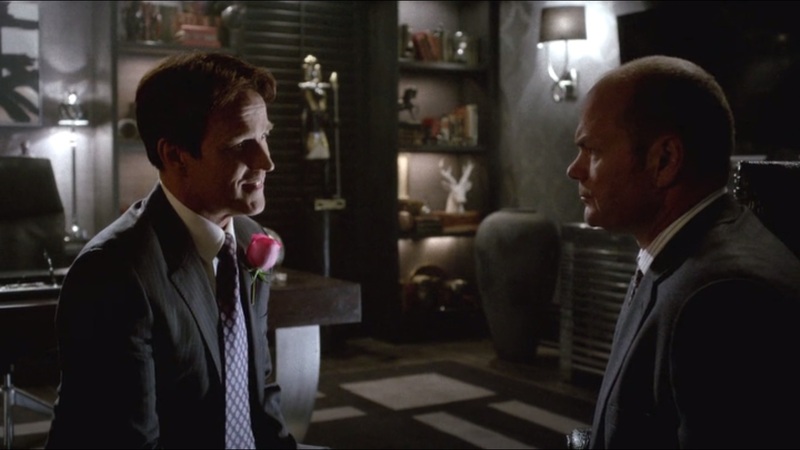 A Look at True Blood- Series Finale: “Thank You” | What Else is on Now? 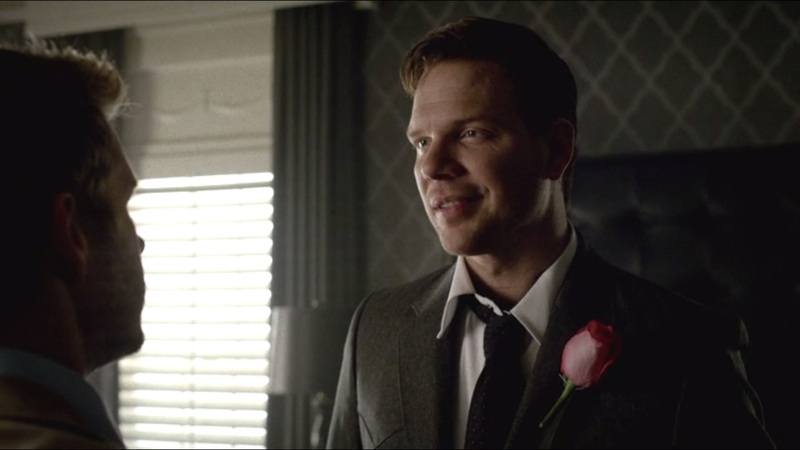 The episode begins with Sookie letting Bill into the room where he first summoned her. Sookie cuts Bill’s trip down memory lane short by letting him know that nostalgia and suicide don’t mix. I tend to agree. Sookie just wants to see Bill live, but Bill asks her to imagine a life without him. The two know they’ve been down this road before: Sookie will leave Bill for a moment, but find her way back to him. This virus has made Bill feel more human than when he was, but his grave is still a lie. He should be in the ground with his family. Bill believes that, by existing, he’d be denying Sookie the best part of life. He’s seen the way Sookie acts around kids and hopes that she’ll, one day, have some of her own. Sookie says that it should be easy for Bill to just swear her off, but he can’t because he loves her too much. Isn’t that precious? And just a bit stupid? Bill wants Sookie to grant him the ultimate kindness by using her fairy light to kill him. If not, other vampires will come after her. By doing this, she’ll rid Bill from her life and be normal at the same time. Sookie needs to think this over. At Fangtasia, Eric unchains Sarah, but glamours her into taking some of Pam’s blood so the two will always be able to track her. Eric reveals his ultimate plan to Pam: kill Mr. Gus, get rid of the Yakuza and steal New Blood for themselves. As Sarah leaves, she’s instructed to wait for Pam to find her. When Mr. Gus and the Yakuza arrive, they’re dispatched of…fairly quickly, actually. Huh. Eric deals with the remaining Yakuza before Sookie can spot them from her home. Sarah makes her way to a carousel and feasts on food from the garbage. Goodness, woman, you haven’t fallen that far yet. Pam finds her in no time. The carousel, as Sarah notes, is the same location where Eric turned Willa. She read about it in Bill’s book, which Pam only skimmed to find the parts that mentioned her. She would do that. Sarah admits that she’s a horrible person, but to solve that, she should be made into a kickass lesbian vampire! And Sarah’s dead serious. Pam, however, won’t turn her. She’s also not a fan of Sarah bringing up Tara. Instead, she feeds on her. Jessica and Hoyt come by Bill’s, as Jessica has a few words for her maker: she doesn’t want him to die, but she’ll be fine regardless. She still doesn’t understand why he’s doing this, and frankly, I don’t think anyone else does, but she will eventually accept it. That’s all Bill needed to hear right now. He asks if Hoyt would ever ask Jessica to marry him, and after an awkward moment, Hoyt tells Bill that he would eventually ask. This prompts Jessica to talk with Bill in private. Having marriage thrust upon her isn’t what she wanted. After all, Hoyt’s memory of her only goes back by a day. Bill wants to make sure Jessica was spoken for after he dies, as he was turned before he had a chance to see his daughter, Sarah, wed. Well, Jessica asks, if Hoyt did want to marry her, could it be today? Somehow, I don’t think marriage works like that. Now it’s raining. Sookie has a flashback to when Grandma gave her and Tara hot chocolate. Young Sookie reads Young Tara’s thoughts and learns that she likes Jason. Sookie, however, doesn’t like anyone, particularly boys because they’re weird. Plus, she has no intentions of getting married. 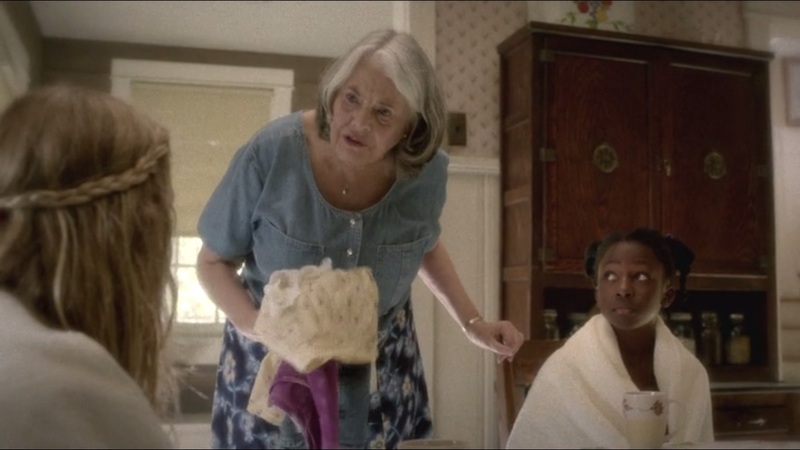 Grandma, however, tells Sookie that she can have any life that she wants to have because she’s entitled to it! Remember that, Sookie Stackhouse. All right. Sookie heads to Jason’s, but finds Brigette instead. Sookie wakes up Jason to tell him about Bill’s request to be put out of his misery. Jason, rightly so, tells his sister that he has no advice for her, but he’ll love her anyway. Moments later, Jason and Sookie receive calls from Hoyt and Jessica, respectively, about an upcoming wedding. Andy, Holly and Arlene arrive for the big wedding. Inside, Bill speaks with Andy in private. He acknowledges the difficult history between them, but Andy is still ill’s eldest remaining heir. When he dies, the house will be passed to Andy, and he’d like to rent it to Hoyt and Jessica for the sum of a dollar a month! Sounds affordable. Upstairs, Jason helps Hoyt get ready. He tells Hoyt that Brigette will be heading back to Alaska tonight and that it’s probably a bad idea to call her. Hoyt apologizes for the punch, but Jason tells him that he deserved that and a lot more if it meant Hoyt returning into his life. Hoyt tells Jason that he feels like Harrison Ford did in Regarding Henry, where he had to relearn everything he ever acquired. Jason comforts him with a single question: if the world ended tomorrow, who would he want to be by his side? Jessica, clearly. The moment arrives with Andy officiating the ceremony with no Bible, no rings, and no official vows. They aren’t even in a bloody church! But this is True Blood. This would be considered normal for these people. During the ceremony, Sookie, surprisingly, reads Bill’s thoughts of how much he loves her and wishes that she could have this kind of happiness right now. He’s also in excruciating pain. 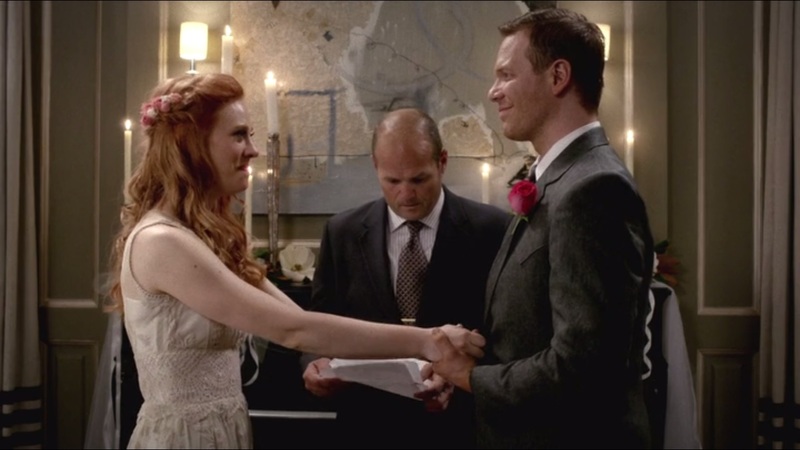 After this mock wedding, Sookie tells Jason about how surprising it was that she could read Bill’s thoughts and thinks back to what Bill said about feeling more human than ever. Oh, and she sort of suggests that Jason sleep with Brigette since she isn’t Hoyt’s girlfriend anymore. I’ll get to this later. Sookie then pays Reverend Daniels a visit for some advice: was she a mistake if God supposedly made everyone in his image? The Reverend tells Sookie that people in Bon Temps are saying that they wouldn’t be around right now if it wasn’t for Sookie Stackhouse. Huh. Guess we missed those conversations. He then tells her that God doesn’t lead our lives- rather, we make our own decisions. So says Sookie Stackhouse, help is on the way. She calls Bill to tell him to meet her at sundown for the arrangements. That evening, Bill meets her at Bill’s grave. A coffin is already inside because some soldiers never returned home during the war. The coffin was meant to be palatable for the families. He looks inside the coffin and finds a photo of him and his daughter in a small case. Bill prepares himself and the two vow to never forget one another. Sookie prepares her magical fairy ball, but stops short of using it. This is who she is- it’s part of her. Bill will always be a part of her, too, but she can’t do this for him. She cuts off her energy and, instead, breaks the shovel in two. Taking the pointy end, Sookie kisses Bill Compton one final time before driving the wood into his body. Sookie cries as Compton’s blood covers her body, but she composes herself, begins covering the grave and leaves the cemetery. One year later, New Blood President and CEO Eric Northman and the ever lovely Pam De Beaufort discuss their new product and the origin of it. The two never did catch Sarah Newlin, but they found traces of her blood and managed to synthesize it. Three years after this, Eric and Pam are at the New York Stock Exchange. 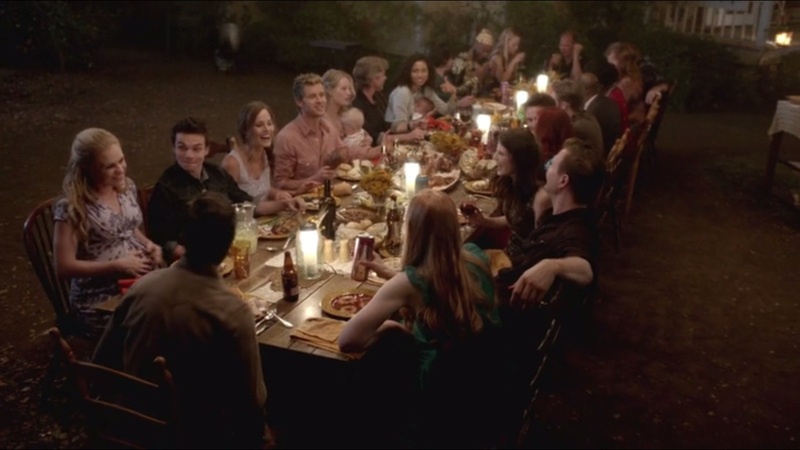 And then we cut to Thanksgiving, as the remaining survivors in Bon Temps- plus Sam, Nicole and their daughter, for some reason- sit down and have themselves a merry little Thanksgiving dinner. Oh, and Sarah Newlin’s not dead. She’s chained in the bottom of Fangtasia while Pam has vampires feed on her. What’s she thankful for? Not a damn thing. Well, that was a series. 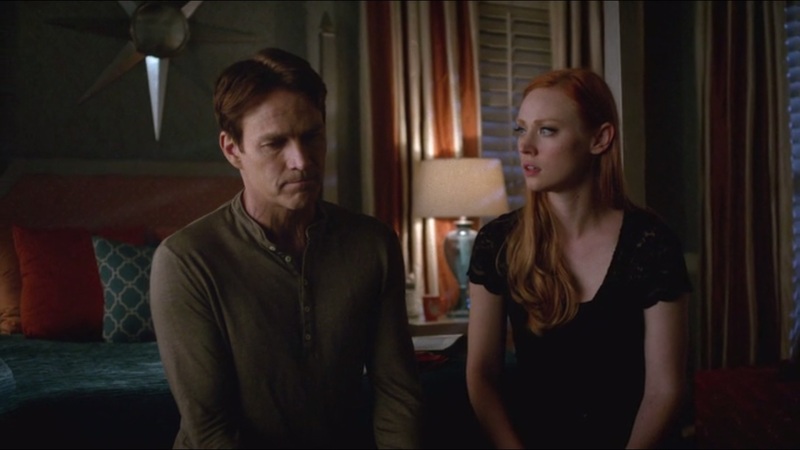 From the premiere, this final season of True Blood has been lukewarm. Let me be clear: True Blood has never been what I’d call stellar or groundbreaking television. It can be entertaining even when it’s bad because of good humor, but this season didn’t have that. There were more misses than hits and it’s made worse because this is the final season. There’s no strict code or formula that television shows need to follow for their final episode, but you want it to at least be a satisfying ending. You don’t want something that feels underwhelming or incomplete. That’s why people still have gripes with the endings to such series as Seinfeld, The Sopranos, and, recently, Dexter. If anything, the episode tried to focus on characters accepting who they are and making their own decisions for themselves, but even that didn’t entirely feel genuine. Sookie chose to kill Bill on her own terms, but only after not killing Bill the way that he wanted her to. Jessica had dreamt of weddings, and despite how sudden it was, she still chose to marry Hoyt in no time at all, despite how short their relationship has been. The show seemed to know how worn out and tired the formula had become when Sookie and Bill talked about how often they’ve been down this break-up road before. 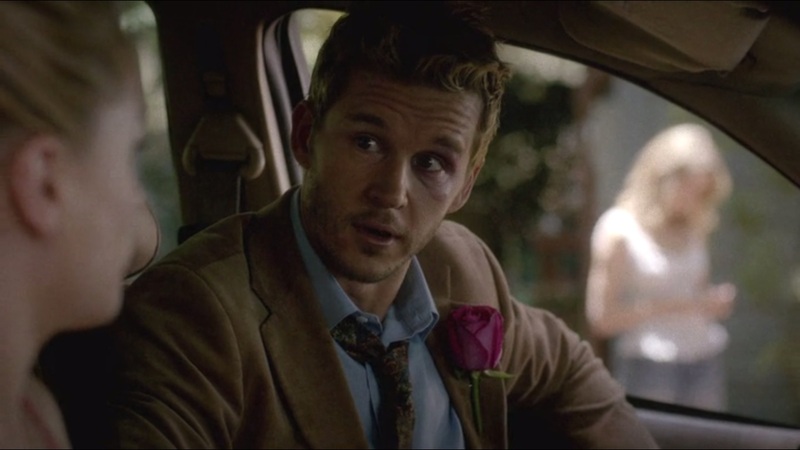 Other shows would try to be clever with that sort of meta humor, but True Blood doesn’t have that sort of spark. At least, not this season. More than that, we got more flashbacks of Sookie basically receiving encouragement from other people. Encouragement that, at this point, she shouldn’t even need. Like the flashback to Tara’s childhood with Lettie Mae, we already know these things about the characters and shouldn’t have to be spoon fed this again just because it’s the final episode. Even if True Blood wanted to take a nostalgia trip on its final episode, it’s done more than enough with so many flashbacks, and we never did get much of a payoff to Bill’s. We know Sookie would eventually make her own decision. We knew that Hoyt and Jessica would probably end up happily ever after, even if it did feel convoluted, and forced. My point is that nothing in this episode or even this season felt particularly memorable. There were some interesting places to go with Sarah Newlin being the cure or the Hep-V vampires, but subplots were rushed over so quickly to get to the next one that the writers just seemed to lose interest in the show altogether. Let’s just get the characters done and over with. Sookie decides to keep her ability and kill Bill her way. Fine. We did not need to drag this out for so long with Sookie acting like she needed so much time to make up her mind. She accepts who and what she is, even if she’s not a fan of being fae, but this should have made her final decision all the easier, especially given how insulted she was at Bill’s request for her to kill him. That said, the shot of her covered in blood was a nice image. So who is the lucky guy that knocked Sookie up? Who knows? People divide themselves into the Sookie and Bill or Sookie and Eric camps often, from what I’ve read from fans of the series. Me personally? I couldn’t care either way because that doesn’t affect my enjoyment of the show. Jason. Oh, Jason. What happened? You were doing so well last episode by not bedding Brigette and you looked like you would stick to that. But flash forward a few years and he’s not only bedded Brigette, he’s got kids! He did say he wanted kids, yes, but he took one step forward and two steps back! If Jason was so committed to changing his act, let Brigette go and live her life. Don’t put the two together for the sake of convenience and to give them a happy ending. Wasn’t he supposed to be growing up? And it’s even worse that Sookie was the one tempting Jason to sleep with Brigette by giving her approval. Oh, by the way, now that Jason and Brigette are officially an item, this makes the scene where Jason gets her a flight to Alaska completely pointless! Again, I’m fine with Hoyt and Jessica getting married, but like getting them together or hooking Brigette up with Jason, I’m not a fan of the execution at all. It’s hard for me to feel anything when this decision feels so rushed. In fact, I’m surprised there wasn’t a double wedding. Hell, they already acknowledged that the marriage wouldn’t be recognized by the state, there were no rings, no vows or even a bouquet of flowers to throw. It was about as unconventional of a wedding as there could be. Why not go all out and have Jason and Brigette get married, too? And what happened with Andy wanting to make an honest woman out of Holly? That never did get brought up again, did it? I’m sounding like a broken record, but Eric and Pam commanded this season from start to finish. It helped that they had an actual arc that built upon the relationship they’ve forged for years. They had the best chemistry, dialogue, and motivation to go after Sarah Newlin. Like the Hep-V vampires, I think they dispatched of Mr. Gus and the Yakuza a bit too quickly, essentially proving them to be ineffective as adversaries. They made this season worth watching and it felt like their characters had the more interesting storyline than whatever everyone else did. This season has felt uneven from start to finish. If it wasn’t rushing through one plot to get to the next, it slowed to a crawl and wanted us to reminisce about things we already knew. The season had no regard for slowing down and letting audiences absorb what they’d witnessed and characters had to practically spell out what we were meant to feel. For my money, any attempt at real tension or drama fell flat under poor writing, ill thought out character motivations and rushed storytelling. Again, I’m not asking True Blood to be some revolutionary television show, because it isn’t. What I’m asking for is a satisfying conclusion to a show that’s almost six years old. What we got instead was a very forced, sappy ending from a show that felt obliged to tie up loose ends while still not offering a rewarding experience. And still so much remains unanswered. If the Hep-V vampires had a constant need to feed, why didn’t Bill ever have that urge? Who fights for vampires in Bon Temps now that Eric and Pam are living the rich life? It has to be said, this is the most disappointing ending to a disappointing season. There was never any real sense of urgency or threat. Characters waited for things to happen instead of relying upon the instinct that’s gotten them this far. While Eric and Pam were entertaining, they alone can’t make up for what was a sad attempt to force a happy ending upon viewers that stuck around with the show for this long. I’m no professional at all and my word isn’t law, but I cannot recommend this final season of True Blood except to those who are very curious. It’s almost insulting that the show has been reduced to this after being so entertaining. Watching this season became a chore just to find any little moment that made an otherwise dull episode worthwhile. Are there good things within this mess of a season? Yes. But you’ll have to do a lot of waiting to get there as HBO’s vampire drama finally drags itself across the finish line to accept the True Death. This entry was posted in True Blood and tagged Aaron Christian Howles, Adilyn Bellefleur, Adina Porter, Amber Mills, Amelia Rose Blaire, Andy Bellefleur, Anna Paquin, Arlene Fowler, Arthur Darbinyan, Ashley Hinshaw, Bailey Noble, Bess Armstrong, Betty, Bill Compton, Bon Temps, Brett Lorenzini, Brett Rice, Brett Rickaby, Brian Patrick Mulligan, Brianne Davis, Caroline Compton, Carrie Preston, Charlaine Harris, Chris Bauer, Crystal, Dale Raoul, David Bickford, Deborah Ann Woll, Deputy Kenya Jones, Deputy Kevin Ellis, Derek Mears, Dr. Ludwig, Drew Rausch, Dustin Ingram, Gabriella Wright, Gregg Daniel, Guru Sanbir Dutta, Haley Brooke Walker, HBO, Hep-V, Holly Cleary, Isabella Rice, James, Jane Bodehouse, Jason Stackhouse, Jessica Hamby, Joe Thornton, John Rezig, Julian Fortenberry, Jurnee Smollett-Bell, Kapneck Law Offices, Karen, Karolina Wydra, Kathleen York, Kristin Bauer van Straten, Lafayette Reynolds, Lauren Bowles, Lettie Mae Thornton, Lily Knight, Louis Bodehouse, Luke Grimes, Mack, Madeline Kapneck, Magister, Malcolm Goodwin, Mandy Levin, Massi Furlan, Maxine Fortenberry, Maz Jobrani, Michael Rothhaar, Mr. Gus Jr., Najat, Natalie Hall, Nathan Parsons, Nelsan Ellis, Nicole Wright, Nizar, Noah Matthews, Pam De Beaufort, Patricia Bethune, Paul Rae, Paula Jai Parker, Republicunt, Reverend Daniels, Reverend Skinner, Robert Baker, Rocky Cleary, Ronnie, Rutina Wesley, Ryan Kwanten, Sam Merlotte, Sam Trammell, Sarah Compton, Shannon Lucio, Shishir Kurup, Sookie Stackhouse, Stephen Moyer, Sylvie, Tanya Wright, Tara Thornton, Tedd Lowe, Terry, vampires, Vince, Violet, Wade Cleary, Will Yun Lee, Willa Burrell, Zeljko Ivanek by omarid513. Bookmark the permalink.